The Department for International Trade (DIT) is an international economic department responsible for securing UK and global prosperity by promoting and financing international trade and investment, and championing free trade. It is working to establish deeper trade and investment relationships with countries beyond the European Union. 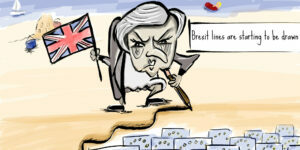 As set out in the Government’s White Paper “The Future Relationship Between the United Kingdom and the European Union“, the UK’s proposal for its future economic partnership with the EU would enable the UK to pursue an ambitious bilateral trade agenda. Negotiating and implementing Free Trade Agreements (FTAs) with countries beyond the European Union is a key part of this. 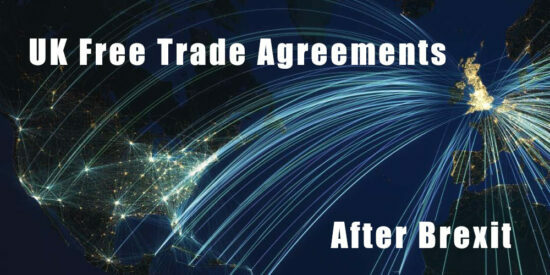 Free Trade Agreements enable trade and investment, secure access for UK exporters to the markets of today and the future, give consumers access to a greater range of products at lower prices, and make the UK more innovative, competitive and prosperous. – an instrument of foreign policy – some countries use trade policy (including trade agreements) to advance standards and values. DIT is committed to using high-quality evidence to inform its trade policy. It is conducting a consultation to seek views from stakeholders on the economic, social and environmental impacts of an FTA with the United States of America (US). – provide information to respondents wishing to submit evidence setting out their views on the priority areas and expected impacts of an FTA with the US. The pack provides a brief overview of the economic impacts of FTAs and the primary mechanisms through which they can affect businesses, consumers and workers. A Free Trade Agreement (FTA) is an international agreement which removes or reduces tariff and non-tariff barriers to trade and investment between partner countries. Trade and investment barriers can make it more difficult and costly to trade or invest overseas. By removing or reducing them, FTAs can make it easier for businesses to export, import and invest. They can also benefit consumers by providing a more diverse and affordable range of imported products. – bilateral agreements primarily relate to the liberalisation and regulation of trade and investment between the two signatories to the agreement. FTAs differ from customs unions. 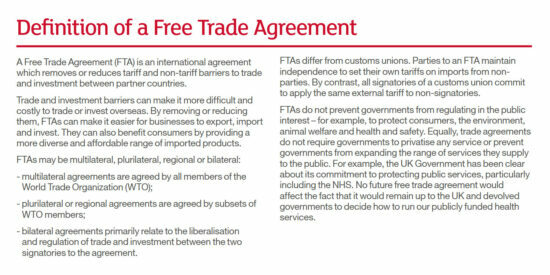 Parties to an FTA maintain independence to set their own tariffs on imports from non-parties. By contrast, all signatories of a customs union commit to apply the same external tariff to non-signatories. FTAs do not prevent governments from regulating in the public interest – for example, to protect consumers, the environment, animal welfare and health and safety. Equally, trade agreements do not require governments to privatise any service or prevent governments from expanding the range of services they supply to the public. The number of free trade agreements (FTAs) around the world has grown substantially in recent decades (Chart 1). FTAs can vary in their scope and level of ambition. Less complex agreements focus more on trade in goods and the elimination of tariffs. Over time the scope and depth of FTAs has generally grown, including provisions addressing trade in services and investment. FTAs increasingly address domestic policies inhibiting trade and investment, known as “behind the border” barriers. The provisions included in free trade agreements (FTAs) vary across agreements. The World Bank has created a database that summarises the content of all FTAs that were in force and notified to the World Trade Organisation (WTO) as of 2015. (1) It covers 279 FTAs. For each agreement, the commitments are classified in one of 52 categories (outlined in Table 1 below) and distinguished according to whether or not they are legally enforceable. Some areas of policy cooperation are more commonly included in FTAs than others. The World Bank classifies 18 of the 52 areas of policy cooperation as “core” provisions. 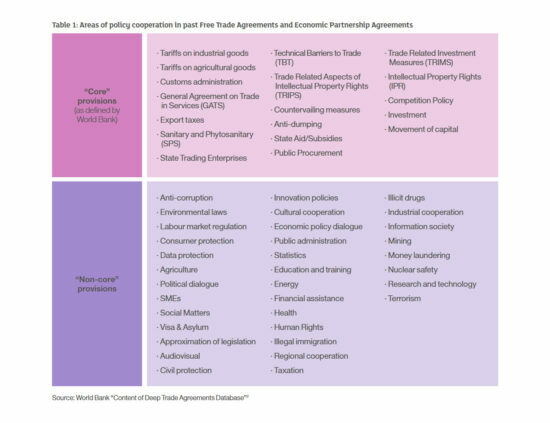 These are provisions which the World Bank identify as most meaningful from an economic point of view and have appeared most frequently in FTAs. “Non-core” provisions – which sometimes go beyond areas directly associated with trade and investment – have appeared less frequently in FTAs. As with all provisions, their inclusion typically depends upon the specific objectives of an agreement and the preferences of the partners involved. A further description of these provisions is provided at the end of this document. 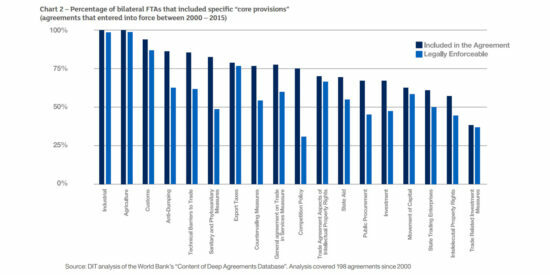 Chart 2 shows the proportion of FTAs which include each of the “core” provisions. – enhancing productivity through a more efficient allocation of resources and greater openness to international competition. 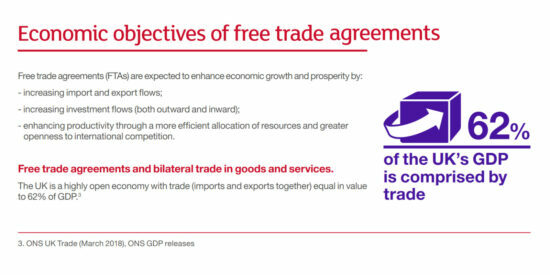 Free trade agreements and bilateral trade in goods and services. Source: ONS UK Trade (March 2018), current prices. Trade in goods represented 64% of all UK trade and 55% of UK exports in 2017(4). International trade in goods is subject to a wide range of tariff and non-tariff measures. These can significantly increase the costs and difficulties associated with international trade. Higher costs reduce the profitability of international trade, raise prices and reduce consumer choice globally. Tariffs can be implemented in a range of ways, including ad valorem tariffs, non-ad valorem tariffs, tariff rate quotas and countervailing measures. (5) These can be levied with the objective of protecting domestic producers, raising revenues, or both. Non-tariff measures (NTMs) are policy measures that may have an effect on trade by changing what can be traded, and at what price. For example, goods may need to comply with technical regulations. There can also be a need to meet requirements intended to protect humans, animals, and plants from diseases, pests, or contaminants. NTMs may occur at the border or ‘behind the border’. Behind the border refers to any NTMs that are applied inside an individual country but do not get checked at the border and therefore do not stop a product entering – for example labeling requirements. NTMs can serve legitimate public policy objectives, and they do not all reduce trade. For example, the enforcement of high product standards may increase consumer demand for some goods. However, in other cases, non-tariff measures can act as barriers, raising trade costs and reducing trade. 4. ONS UK Trade (March 2018), current prices. 5. Ad valorem tariffs are based upon a percentage of the value of a good, while non-ad valorem tariffs are based on the weight or the ingredients within a good. Tariff rate quotas allow a specific quantity of goods to enter at a reduced or tariff-free rate before higher duties are charged. Countervailing measures are duties levied on goods from countries which may have unfair state subsidies. – Lowering costs: Reducing tariffs between countries can increase opportunities for businesses that export and import, and improve choice for consumers. Tariff liberalisation may be immediate or phased over several years. – Providing greater certainty: Countries sometimes apply lower tariffs than those they have committed to in their WTO schedules. FTAs can remove or reduce the gap between the maximum tariffs countries have committed to and the tariffs they apply in practice. This means that exporters and importers do not face the risk of tariffs suddenly being raised. – Providing greater ease: FTAs can streamline customs procedures within partner countries to facilitate the entry of goods, reduce administrative costs and reduce delays. These measures reduce the costs of trade and allow production to take place across borders. – Removing or reducing non-tariff barriers to trade, and improving policy cooperation on non-tariff measures, can reduce the cost of trading products internationally. This can both increase the number of exporters and also increase the value of trade undertaken by existing exporters and importers. 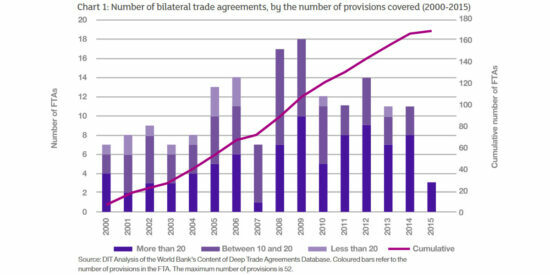 Not all of the increases in bilateral trade between partners of an FTA represent additional trade at a global level. Some of the increases will have been diverted from trade with other countries that are not in the agreement. From an economic perspective, free trade agreements provisions can reduce the fixed and variable costs associated with trading internationally, leading to an increase in both the number of exports from existing exporters. Free Trade Agreements (FTAs) liberalise tariffs on a preferential basis between parties. Unlike in a customs union, members of an FTA can decide the tariffs which they apply to imports from any other country, and the FTA provides an opportunity for members to agree to offer each other preferential rates of tariffs below these generally applied levels. In order to ensure that only members of an FTA can benefit from these preferential tariff arrangements, the parties to the FTA need to agree a set of rules of origin to determine which goods imported from a partner country can qualify for preferential tariff treatment under the agreement. Rules of origin are necessary to prevent goods from other countries taking advantage of preferential tariff rates. However, implementing, administering and complying with rules of origin can generate costs. 1. 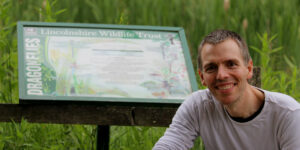 Wholly originating: the good must have been entirely created or produced in the partner country. c. Specific process rule: a good must undergo a set production process, for example a defined chemical reaction as set out in the Comprehensive and Progressive Agreement for Trans-Pacific Partnership. The FTA sets out which of these rules each product must meet. This means that services provide an important source of inputs which are used to make UK exports. As defined under the WTO’s General Agreement on Trade in Services (GATS), trade in services is categorised in four ways (modes). A company in one country can sell services across a border to consumers in another (Mode 1), a consumer can buy services while abroad (Mode 2); a company can establish a commercial presence abroad to provide services (Mode 3) and services suppliers can travel abroad to provide a service (Mode 4). Services trade is not subject to tariffs. However, each mode of service supply can be subject to a range of ‘behind-the-border’ measures. These may restrict the access of foreign service suppliers to the market or discriminate against foreign suppliers in favour of domestic suppliers. As with non-tariff measures affecting trade in goods, regulatory barriers affecting services can achieve legitimate public policy objectives. However, in some cases, they have an unwanted effect of impeding trade in services and it is desirable to remove them. 11. OECD Trade in Value Added dataset. Economic evidence suggests that deep trade agreements increase services trade if they include provisions on specific sectors and tackle pervasive behind-the-border barriers, such as regulatory alignment and national treatment rights. (14) Services and goods trade are interlinked, so that an open services sector is an important contributor to maintaining internationally competitive goods sectors. – Lowering barriers and levelling the playing field: Liberalising services trade by lowering barriers allows for greater market access for foreign services suppliers. – Providing greater certainty: ‘Locking-in’ currently applied levels of market access ensures greater certainty for businesses and encourages new exporters to incur the fixed, sunk costs required to export their services. – Reducing costs: Regulatory alignment and transparency can reduce the ‘compliance costs’ associated with meeting regulatory requirements of a trading partner’s regime to enable trade in services. The UK is both a major destination and source of overseas direct investment. The value of the total stock of (inward) Foreign Direct Investment (FDI) in the UK has been rising noticeably over recent years, from under £600 billion in 2007 to around £1.2 trillion in 2016. 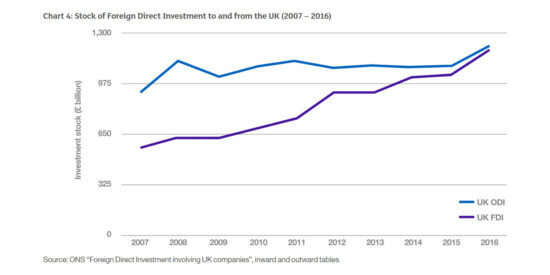 The value of the UK’s stock of outward direct investment (ODI) has been more stable over the last decade, and was also around £1.2 trillion in 2016. Investment between countries generates many economic benefits. It leads to a more competitive business environment, which in turn creates jobs, increases innovation and generates economic spill-overs to the rest of the economy. (15) There is also evidence of links between trade and investment. Despite the benefits, global investment can be unnecessarily restricted by host government measures. Modern free trade agreements (FTAs) therefore increasingly include provisions relating to investment, including investment by establishing a commercial presence abroad. FTAs can seek to create a level playing field between domestic and foreign investors by prohibiting discrimination, market access barriers, and measures that could unduly distort investment flows. FTAs can also seek to increase certainty for investors by providing them with protections against arbitrary or manifestly unfair treatment. Addressing risk and uncertainty is particularly important for companies that may incur significant “sunk” costs(16) when they invest. The right of governments to regulate in the public interest is recognised in investment chapters in FTAs. 16. A sunk cost is a cost that once a business pays can no longer be recovered by any means. 17. See for example: Lejarraga and Bruhn, 2017, Velde and Bezemer, 2006, Büthe and Milner, 2014, Kim, Lee and Tay, 2017, Kohl, Brakman and Garretsen, 2016, and Berger et al., 2013. “Productivity” is defined as the amount of output that an individual, firm, sector or economy can produce from a given level of inputs. Productivity growth is the single largest determinant of living standards and one of the principal determinants of long-run economic growth. Theory suggests that openness to trade and investment may be an important driver of productivity growth. Trade liberalisation can result in a more efficient allocation of resources in the economy. It can shift the pattern of production in each country towards products and services in which the country has a comparative advantage. In doing so the price of goods and services across the economy can fall, benefiting consumers. Greater opportunities to sell overseas should reward the most productive firms, allowing them to expand and attract investment, while competition encourages less productive firms to innovate and adapt. Competition can also provide companies with the incentive to invest in the skills of their workers, adopt better management practice and innovate in their use of capital, raising the productivity of firms and the workforce. FTAs are expected to boost overall trade, investment and productivity. 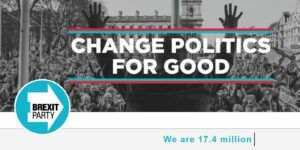 They can have different impacts on groups within society, such as businesses, consumers or workers. Free trade agreements (FTAs) can generate a range of opportunities and challenges for businesses. Providing greater market access for existing exporters, increasing the number of companies that export, and providing access to more imported inputs are important benefits of trade liberalisation. – FTAs can help businesses by expanding the size of the market into which they export. As well as increasing turnover, this can allow businesses to benefit from economies of scale, lowering their operating costs and raising profitability. This can help them attract investment and expand further. – By reducing barriers on imports, FTAs can reduce costs and expand the choice of imported inputs for businesses. This can help to raise the competitiveness of businesses. – Where they include investment provisions, FTAs can help to foster a favourable investment environment and provide a level playing field. This can help businesses to invest overseas more easily and attract investment from partners abroad. – Where FTAs reduce the fixed costs of exporting, they are likely to provide particular benefits for small and medium-sized enterprises. This can raise the number of smaller firms which find it profitable to export, helping to spur innovation and increase productivity. – The evidence shows that increased competition from trade promotes business innovation and growth. Some sectors may expand, creating more jobs and prosperity but some sectors or companies, which fail to adjust to such competition, can be adversely affected. According to the World Bank database on the content of FTAs, over 90% per cent of the 279 agreements in the database include customs provisions. (20) Where these provisions address bottlenecks and streamline customs procedures, they can reduce the administrative or procedural costs faced by businesses when exporting and importing. As with any economic policy, it can take time and effort for businesses to familiarise themselves with the changes. Businesses will incur some costs as they learn how to take advantage of the new commercial opportunities. FTAs can also generate additional administrative or compliance costs associated with meeting the requirements of rules of origin. Agreements can be designed in a simple and transparent manner to minimise the familiarisation costs and administrative burden caused by rules of origin. 1) Increases in product quality, variety and consumer choice. Lowering trade costs between countries raises the probability that businesses will find it profitable to trade. This increases the number of firms that trade, and the variety of products traded. 2) Welfare gains from lower prices for existing products. 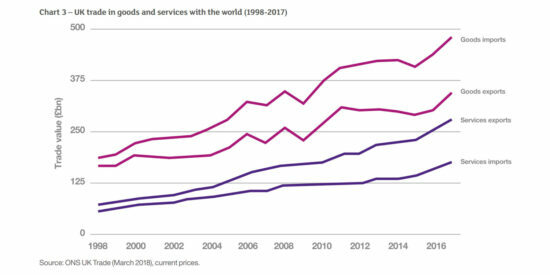 Reducing barriers on consumer goods and the regulatory barriers affecting cross-border trade in services can generate lower prices for consumers. In addition, FTAs often benefit consumers indirectly through an impact on domestically produced goods. They can stimulate competition, resulting in lower prices for consumers. Domestic firms also benefit from improved choice, quality and lower prices of their intermediate inputs, which may be passed on to consumers in the form of lower prices. Consumers can also be affected by specific provisions within FTAs. Applying the World Bank’s classification, the most relevant provisions are likely to relate to competition policy, consumer protections, sanitary and phytosanitary standards, technical barriers to trade and e-commerce. Consumers may regard the impact of specific provisions to be positive or negative depending on their individual perspectives and priorities. As set out in the White Paper “Preparing for our future UK trade policy”, the UK Government is committed to maintaining high standards of consumer protection for its citizens. Just as free trade agreements (FTAs) present opportunities and challenges for businesses, they also generate opportunities and challenges for the workers of those businesses. 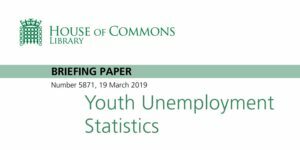 They can also affect the dynamism of the labour market more widely. – Where FTAs boost productivity within firms and sectors, and across the economy more widely, this is likely to generate increases in the employment opportunities and real wages of workers. – Where FTAs lower consumer prices, this is likely to benefit workers in the form of higher real wages, meaning that they can purchase more even at the same wage. Modern, dynamic economies are continually reshaping in line with global developments which drive a continual process of worker and job transition in the labour market. It is possible that lower barriers and greater import competition resulting from an FTA could accelerate this ongoing process. As described above, free trade agreements (FTAs) can affect employment prospects, wages and wider working conditions in specific sectors or for specific professions or skill levels. The characteristics of workers can sometimes differ across sectors, professions and skill levels. It is therefore possible that that these changes could affect various social groups differently and influence the distribution of income. The regional location of workers in different sectors and professions may also vary. This means that different areas or regions within a country may be affected differently by an FTA. The impacts on different groups and regions will depend upon the details of each agreement. The Government will assess the potential impacts on different groups in more detailed studies before and after negotiations take place with partner countries. The economic changes resulting from FTAs have the potential to affect some aspects of the environment including, for example, greenhouse gas emissions, air pollution, water quality and land use. The indirect impacts on the environment may occur as enhanced trade induces the economy to grow (a ‘scale’ effect affecting pollution for example) and as economic activity shifts between sectors with different levels of emissions (a ‘composition’ effect). FTAs can also positively impact the environment as increased trade leads to the transfer of new, potentially more environmentally friendly, technologies and production methods (a ‘technique’ effect). The impact of FTAs on the environment will depend upon the design of an agreement and the economies of the countries involved. As set out in the 2017 White Paper “Preparing for our future UK trade policy”, the UK Government is committed to maintaining high standards of environmental protection in trade agreements. 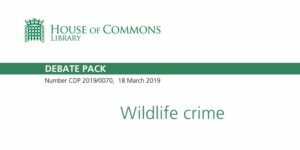 The Government will assess the potential environmental impacts in more detailed studies before and after negotiations take place with partner countries. 22. See for example: ILO (2016). 23. See for example: Caliendo and Parro (2015) and Trefler (2006). 24. For example, the UK is rated as having the 5th most efficient labour market in the world in the World Economic Forum’s Global Competitiveness Report, 2016-17, behind only Switzerland, Singapore, Hong Kong and the United States. Derived from An information pack for the Consultation relating to a bilateral Free Trade Agreement between the United Kingdom and the United States Open Government Licence v3.0.